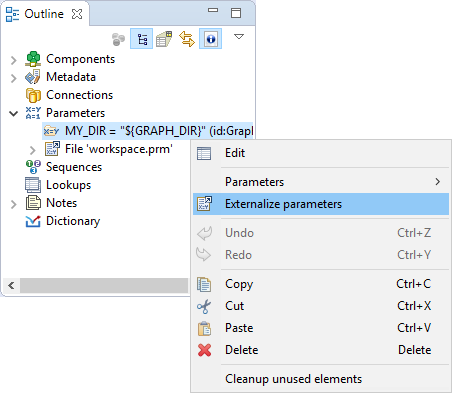 Once you have created internal parameters as a part of a graph, you have them in your graph, but you may want to convert them into external (shared) parameters, so you would be able to use the same parameters for multiple graphs. You can externalize chosen internal parameter items into external (shared) file in the Outline. Choose the internal parameters to be externalized. Right-click and select Externalize parameters from the context menu. A new wizard containing a list of projects of your workspace opens. The corresponding project is offered as the location for this new external (shared) parameter file. The wizard allows you to change the suggested name of the parameter file. After that, the internal parameter items disappears from the Outline pane Parameters group, but at the same location, there appears the newly created external (shared) parameter file which are already linked. The same parameter file appears in the selected project and it can be seen in the Navigator pane.